A perfect example of how the simple flavor of chilies transform an everyday vegetable like cabbage into a truly special dish. In a large colander, combine the cabbage and 1 teaspoon salt and toss to coat. Let stand for 30 minutes in the sink to leach out excess water. Rinse well with cold running water and drain. Wrap the block of tofu well with a clean dishtowel and press firmly with your hands until you feel the towel become damp. Unwrap the tofu and cut it into 1/2-inch cubes. In a large, well-seasoned skillet (preferably not nonstick) heat the canola oil over medium-high heat. Add the tofu and salt it liberally. Fry the tofu undisturbed until it forms a dark golden crust on the bottom, then use a spatula to turn it and brown it well on at least one more side. Drain well on paper towels. 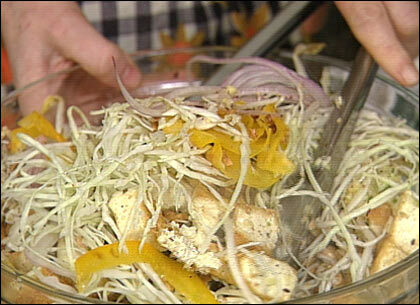 Transfer the tofu to a large bowl and add the cabbage, bean sprouts, and scallions. In a small bowl, whisk together the chilies, ginger, garlic, sugar and vinegar. Pour the dressing over the tofu mixture and toss to coat well. Just before serving, season the slaw with salt and garnish it with the peanuts. 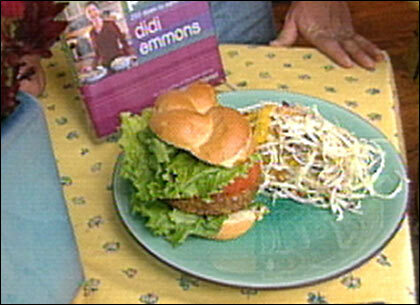 Chef Didi Emmons notes: The texture of the slaw is best when the cabbage is sliced paper-thin. To get the thinnest possible shreds, use a sharp, Y-shaped vegetable peeler or a plastic vegetable slicer. If you don't have either, a very sharp knife will do the trick. This slaw is best served the day it's made, but the vegetables and dressing can be prepared up to one day ahead and stored in separate airtight containers in the fridge. Toss together and add the garnish just before serving. This segment appears in show #2815.